Couple things you could try. All will require you to access PHPMyAdmin from your cPanel. WARNING. Making changes this way could have a negative impact on your site, be sure to backup the database before performing ANY of these actions. 1 - Go to the bx_facebook_accounts table and change the profile ID for your account to 9999, this will remove the Facebook Connect from your account and require you to login manually. 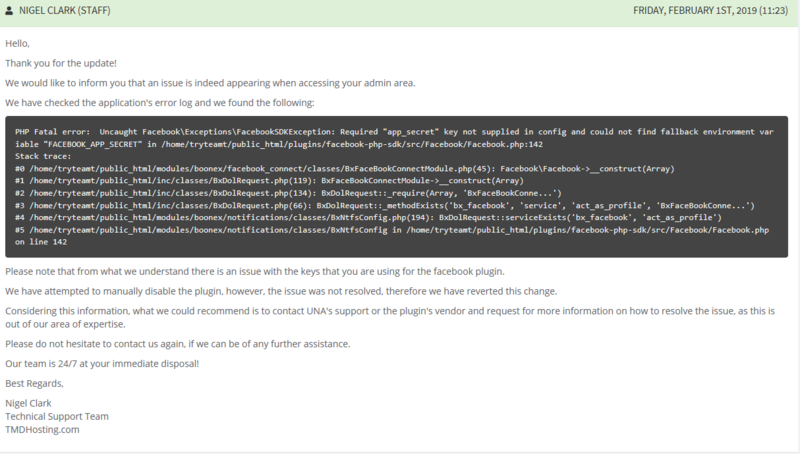 2 - If that fails or your account is not linked to FB go to the sys_modules table and find the row with name "bx_facebook" and change the enabled flag from 1 to 0. 3 - If that fails, go back to the sys_modules table and find the row with name "bx_facebook" and change the pending_uninstall flag from 0 to 1. Lastly, if all else fails. remove the row with the name "bx_facebook" from the sys_modules table and remove drop the bx_facebook_accounts table.